what boggles my mind is how insecure you are, I didn't even take ANY credit away from zambia, because I didn't even watch them play, but when you have all these world class players and you don't win a single trophy in the past 4 editions you're a choker. stop acting like you're a victim of hate, I have nothing against zambia, but ghana and ivory coast choking is quite obvious. Going to do what I should have done from the word go ... ignore the hater. Sage, stop spoiling GK's moment...he was just so excited, and naturally so..you know I'm your biggest fan but sometimes you do come across as insecure and a bit too belligerent. Like 'Russel Crowe' in that South Park episode who sailed round the world making movies and looking for a fight. Anyway, yes neutral, Zambia >>>>>> SA currently. Even this: Guinea >> SA. Deal with that. Congrats again GK ..more later today. Back to work now. Thank you Corzioli. Thank you very much. Congrats to Zambia people! No one likes Ivory team anyway, with all those great players, they proved they're pussies once again. Fail not talking about current . Nigeria got no room to talk either, that scoreline prediction is very laughable. Zambia has always been a force in a African football. Much greater than South Africa for example. It was about time we brought the trophy home. Last edited by Sonny.Bill.Williams; 13-02-2012 at 15:04. Nope..it's worth a sure long punt. South African diski has to step up a lot..there's a lot of quality in the PSL (I should know, sometimes I see some games on Supersport) but so far it hasn't been translated to Bafana. With so much quality Ivory Coast still lost.. Thanks everyone. The cup is in Lusaka. Unbelievable! You've only got one year to keep it buddy..that's because you won't be able to DEFEND it in South Africa. Ha. Not with all the fallen giants around. 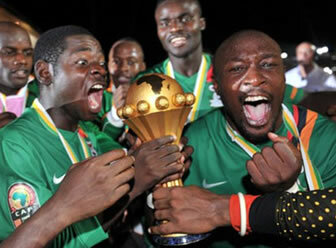 Plus the stakes are much higher..whoever wins reps Africa in the Confederations Cup in Brazil, June '13. So it won't be fun and games this time. Lol. Sorry man. Didn't mean to raise a few tempers. We finally disagree on something I'm too happy to fight, so I hope RSA does well and recovers from the setback. Wonder when qualifications begin. Got to look up the groups. Have they been drawn already? I think so, haven't checked..I remember reading that in one of the sports papers though. And that's not me underestimating you guyz, that's just plain stating the /fahct. Ah, so the groups haven't been drawn a of yet. Last edited by GreatKalu; 15-02-2012 at 05:22.